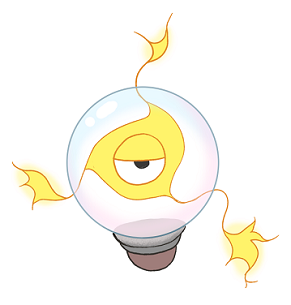 Britebulb is a Electric/Psychic Pokémon. It evolves from Psynapse at level 26, and evolves into Illumni with a Thunder Stone. It is using its energy to create a form that can survive outside its bulb. It becomes hotter the harder it thinks; over-exertion could cause power outages. Britebulb has been witnessed congregating with others of its kind for 'brainstorming sessions'. As it gets new ideas, it becomes stronger. Britebulb is designed after a lightbulb and a nerve cell, with its eye being the 'nucleus' and other nerve connectors forming appendages. The name origin is a portmanteau of brite (bright) and lightbulb.